- Decided to head over to Wild River Road to check out the road conditions and to do some off trail exploring. Well, the road will not be open anytime soon! About a half dozen small to medium washouts and two significant washouts that will need some major work. I wouldn't think this is at the top of the list to fix, but I have no idea how the repairs for roads work, just a gut feeling. 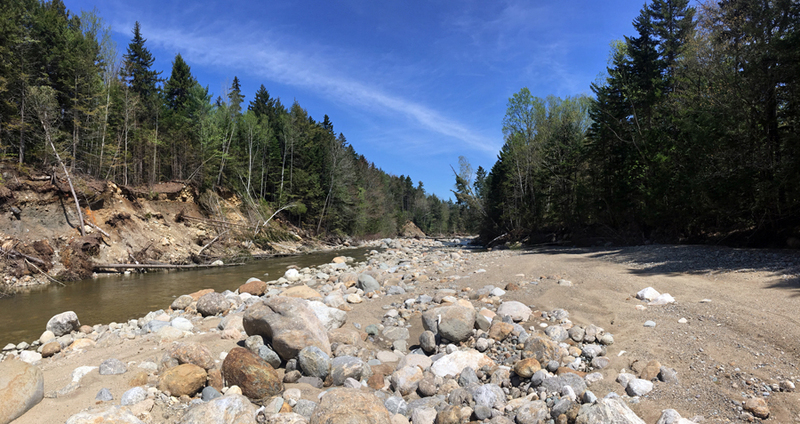 - Also checked out the site of the former Moriah Brook Trail suspension bridge, total destruction to the river banks, incredible to see! - Finally, I went off trail for some old Wild River Railroad exploration and found some old intact rails, which have survived over one hundred years of weather! A crew must have came through to put some dirt over the pipes so they could drive and scope out the rest of the road. No other work has been done yet, might be awhile! Former site of the Moriah Brook suspension bridge, the west bank. 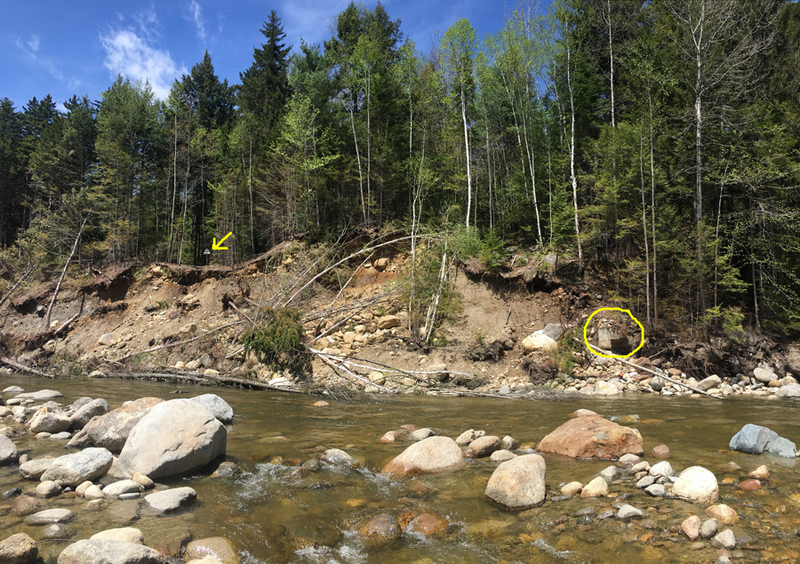 The yellow circle is all that is left of the concrete abutment, a bigger piece was a few hundred feet downstream. The yellow arrow is a trail junction sign! Good thing the bridge was removed before the OCT 30th storm or the bridge would have been destroyed! Closer look at all that is left! Always interesting to see this stuff knowing it's been there for over one hundred years! It just ended abruptly. I traveled the stream a little further but didn't find anything else. I will return soon with a secret treasure map I found in the attic of my friend Mikey's house to find some other off trail stuff in this area! One of my favorite areas of solitude. I once was the maintainer for the Black Angel Trail in the early 80s and spent a lot of time in there. Las summer I spent a while looking for the Old Sanctuary Trail which ran from near Eagle Crag in the Baldfaces to Spider Bridge back in the logging days. I did find fragments of it and discovered where it joined the Black Angel trail just before the Spider Bridge crossing. That is really cool to have found evidence of the Sanctuary Trail, any idea of when it was abandoned? I've heard of a Spider Camp cabin that was left behind after the RR days right in that area of the bridge, but I heard it was ultimately burned down by the forest service, however I don't know when this was. Did you ever stumble upon the cabin or any remains??! !